Roman blinds can offer elegant styling to your windows and are among the most popular window treatments. Their unique features can complement any decor style effortlessly. They are available in a wide range of colours, patterns, and fabrics and are an affordable option to give your home that ‘wow’ factor. Let’s take a look at the benefits of Roman blinds and different rooms they are perfect for among other amazing characteristics that make it a great addition to any home. Roman blinds are simple and contemporary window treatments which hang flat and straight when down and form elegant soft pleats when pulled up. They can be operated using a series of vertical cords and are generally tailor-made to fit any window size. Unlike many modern-day counterparts such as roller and vertical blinds, roman blinds have been around for a very long time. Available in a wide variety of colours, patterns, and fabrics, they are an affordable way of creating a distinct style statement. There are two chief types available, Flat and Classic Roman blinds, however there are other looped and hobbled varieties available too. Flat Roman blinds consist of a single panel of fabric that lies flat against the windows when kept lowered. The flat window treatment can form neat stacks of pleats when raised and appear like an accordion providing a tidy and minimalist look overall. They can be made to appear as a single solid piece or made to contain pleats which are visible when the blinds are fully raised. Another benefit of Roman blinds is once they’re closed, the light filtering can help the patterns and textures be visible through the blinds which wouldn’t be seen when they’re raised. These are varieties of Roman blinds that have folds or pleats cascading down the face to induce an illusion of more depth. Its seamed panache boasts a flat and smooth finish that can work particularly well with smaller patterns and solid colours. Which rooms can they be used in? Due to the huge range of varieties available, Roman blinds can be installed in practically any room. They’re masters at providing a sense of sophistication and can most often be seen in dining rooms, living rooms, guest rooms, and master bedrooms. They also offer a more furnished look when installed in offices and conservatories. However, when thinking of roller blinds for south-facing windows which receive harsher sunlight, you should choose pale colours. This helps reduce the damage that sunlight can cause to the interiors over an extended period of time. Blackout and insulating linings can prevent fading but know that after a few years of consistently facing harsh sunlight, some fading is bound to take place. Blackout linings are ideal for achieving a conducive sleeping environment in bedrooms. What are some of the best and worst fabric choices? You may use patterned, semi-plain or plain fabrics that can be contrasted or coordinated with the colour scheme of your decor. Patterned and pictorial fabrics can help add visual interest and complement the room’s theme rather well while plain blocks of colours can add a pop to the area. Here are some of the best and worst fabric options. These blinds are popular for being very accommodating when it comes to different fabric thicknesses and weights. A lightweight and thin taffeta or faux silk fabric, for instance, can make a crisp and sharp looking blind with a smaller bulk created when they are stacked up. It can also help show off the shine and lustre that they provide. Fabrics with medium weight such as printed or woven cotton and poly-cottons, damasks and jacquards, pure linen and linen-mix all have an ideal weight for Roman blinds. They offer a myriad of patterns, style, and colours and are durable too. Crisp cotton is an exceptional choice for Roman blinds as they are non-stretch fabrics which can offer a stable base for creating beautifully straight and sharp folds and edges. Heavy fabrics such as velvet and chenille should not be avoided as they too can be accommodated by the operating system of this window treatment. The luxurious chenille can furnish a robust and sumptuous look in a period styled home. The heavy material can help improve the insulation and light-control offering a practical solution for an ill-fitted window. The folds, though not as sharp, appear attractively fuller. When installing made-to-measure Roman blinds, it’s hard to go wrong with the fabric, but it’s always best to be well-informed so you don’t end up making costly mistakes. Although you can make them using pure silk, it isn’t recommended to do so as harsh sunlight or moisture can ruin the delicate fabric. Faux leather fabrics which are also known as leatherette are another unsuitable option as they would be extremely difficult to operate, being too thick and bulky. They are relatively harder to stitch, making things even more difficult. Upholstery fabrics, in general, should also be avoided too. Despite their thickness and durability, they’re often coated with fire-retardants. This coating makes them stiff and prevents them from being folded or draped softly. Roman blinds are considered to be the ideal compromise between soft fabrics and stylish practicality. Here are a few reasons why you should consider them for your windows. Roman blinds are a great solution for spaces where curtains would appear bulky and may get in the way of the furniture. They are your best bet if you want to set a softer and cozier ambience which is not possible with Venetian or Roller blinds. 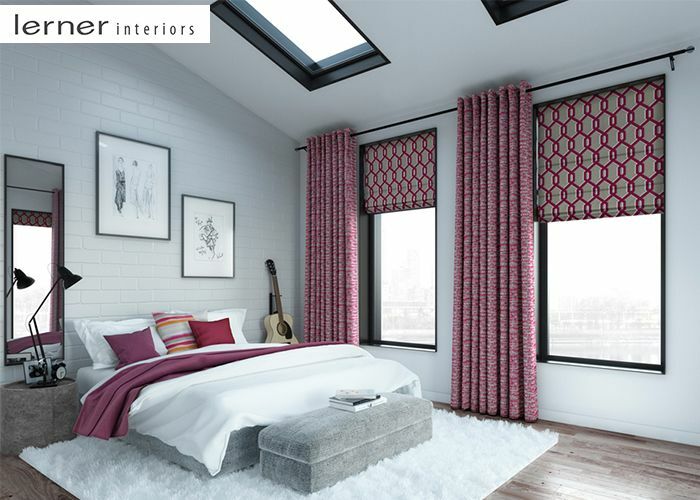 Roman blinds are ideal for rooms where you have a few windows. For example, if you install curtains in a light and airy living room, they may end up covering half the window frame. This can result in the space to look very busy and ruin the aesthetic of the room altogether. Roman blinds, however, can fold away for a tidier contemporary semblance. Roman blinds are simple to both letdown and raise up. Traditionally they’re operated using cords, however, modern technology allows them to be operated using motorized systems. Can Roman blinds be used on Bay windows? Roman blinds are a stylish overlay for bay windows, which are usually difficult to dress. However, take care to consider the angles and corners of the window to guarantee it fits perfectly. Take time and get all of the measurements right to ensure they look elegant and sophisticated whichever room they’re installed in. It’s easy to see why you should have Roman blinds installed in your home. These made-to-measure window treatments offer a stylish alternative that can go well with any decor. With such a wide range of options to choose from, you will surely find the perfect one for any room in your home.